I try to purchase cameras that use 4 AA Batteries. I have purchased about one camera per year for the last 10 years of travel and the majority of them used either two or four AA Batteries. I presently have 20 rechargeable batteries with me, or four packs ready to be used and one set of four inside the camera. 1. The batteries cannot move around inside, therefore the plus and minus ends of the batteries cannot touch. 2. They are all together, if you placed four batteries in your pocket, you may find yourself searching for the one battery. Say for example you are taking a photo of the Whales passing the cruise boat and your batteries go dead. You need to be able to quickly reach in your bag, grab four new batteries and reload fast, this is not the time to be fumbling around in the bottom of your daypack looking for batteries. 3. Keeps the same set of four batteries together, it is better to age batteries together, therefore when you decide the batteries are no longer good, you can trash all four at the same time without testing each and every battery. 4. Counting batteries is easy, I know I have five packages of batteries, I can go off the electrical grid for about two to five weeks. 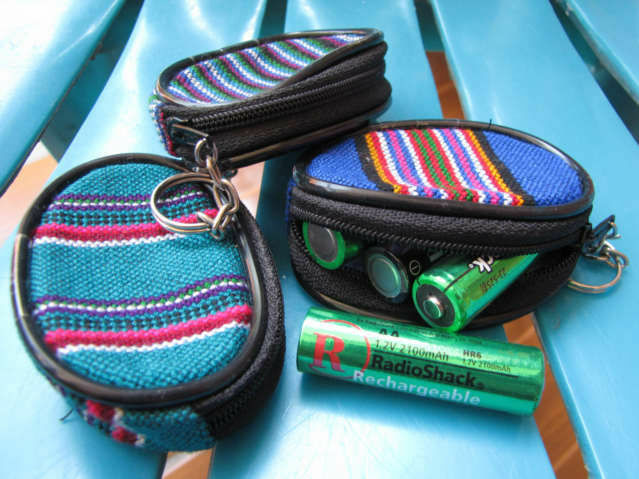 I purchased these small bags in Panajachel, Guatemala two years ago and was reluctant to show this travel tip because of where I purchased the bags. However, a few countries later I realized these bags exist in some form in most countries. I think in the USA it would be called a coin purse and probably could get at some discount store. I am not going to send you to the travel gear store. There is no Travel Gear shop here in Ethiopia, therefore I need to write travel tips about what is possible, not what is impossible to purchase.